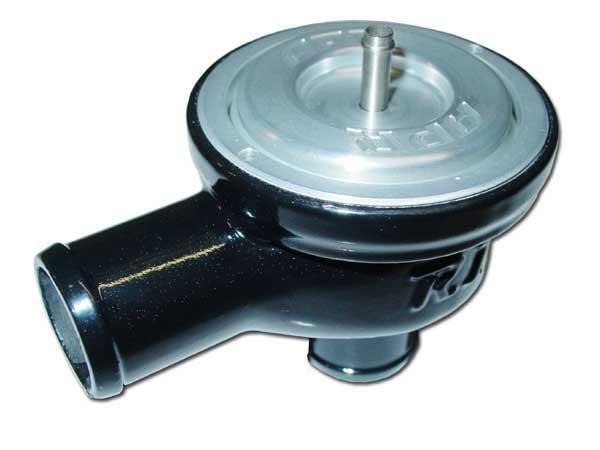 APR Tuned R1 Diverter Valve UNIVERSAL - Dezod Motorsports Inc - Home of the automotive performance enthusiast since 2002. APR’s R1 diverter valve addresses all of the reliability problems of the factory-supplied diverter valves and aftermarket replacements and takes performance to the next level. The R1 is a diaphragm-based valve. A diaphragm is the best option for a diverter valve for several reasons. First off, a diaphragm has negligible friction. Piston-based valves have considerable friction from the piston, o-ring, and bore assembly. The lower friction R1 diaphragm equates to faster response and better overall performance. Secondly, diaphragms do not require the periodic greasing that piston-based valves do. Piston-based valves must be qreased periodically (usually every year or sooner), requiring removing the valve from the car, disassembling and reassembling the valve. The APR R1 was designed to be maintenance free for the life of the product. Thirdly, a diaphragm based valve will never have a stuck piston. Piston-based valves periodically incur stuck pistons (especially if the required maintenance schedules are not followed.) Due to the lack of a piston, the APR R1 solves this problem. The R1 is designed for optimal performance. The main body of the valve is investment cast in an aluminum alloy. By utilizing this casting process in lieu of a more conventional machining process, APR was able to optimize the internal geometry of the valve to provide the ultimate in flow performance. This geometry cannot be created utilizing conventional machining. As such, the APR R1 has much better flow characteristics than other diverter valves. Combined with the low friction diaphragm assembly, this equates to a valve that is truly a performance leader. The materials used in the R1 are standard setting. The diaphragm is created out of high temperature material and incorporates a Nomex fabric reinforcement layer for enhanced durability and a diaphragm that will never tear. The alloy main body is finish machined at APR and receives a multilayer corrosion resistant and cosmetic enhancing finish. All machining and final assembly takes place at APR headquarters in the United States for optimal quality control and consistency.